SONIDO CLASSICS, a sound systems festival, presented by Plusdesign gallery, with supervision by audiovisual group Invernomuto, is running across Milan on February 13. In line with Invernomuto’s blend of urban culture with popular rituals and symbols from folklore, the festival is a tribute to the street cultures of global suburbs. It will also be the final act of a project by Plusdesign, who will present a collection of Colombian traditional sound systems (Picòs). 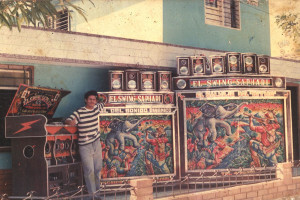 A statement from the organisers explains: “Picò culture runs parallel to other sound system traditions in the world: the Jamaican one above all. But its main difference is in its appearance: each Picò, as well as being meticulously designed in its shape and choice of materials, is also decorated by local painters, with phosphorescent colours and glitter. Each Picò expresses the visual identity of its DJ and owner through the artwork”. SONIDO CLASSICS will exhibit 15 Picòs built by artisans in Colombia, alongside five that have been handed over to the creative authority of European designers: Nathalie Du Pasquier, Delta, Lucas Munoz, Dirk Vander Kooi and Kram/Weisshaar. Also playing at the festival are Dj Rupture, Palmistry, Gqom Oh! with Nan Kolé, Lisbon’s Dj Firmeza and Dj Noronha, and Milan’s Primitive Art, STILL, and Palm Wine.